August 21-23, 2015: We left Put-In-Bay Friday morning and set out to try some fishing. The lake was not calm, but we anchored near Ballast Island and tried it out for a little while. 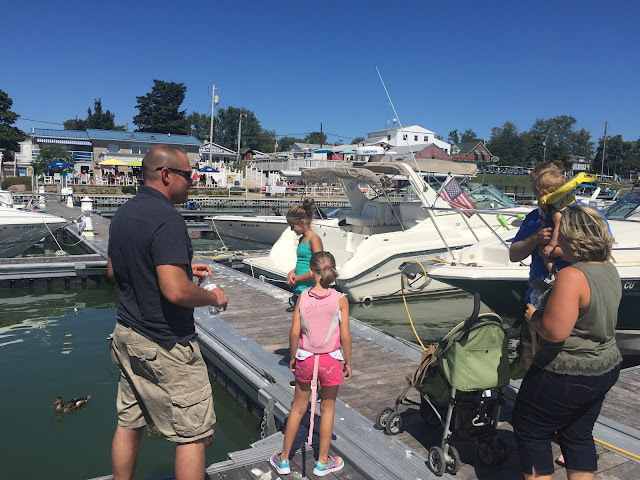 We didn't last long due to the waves and the constant wake from boats coming & going to Put-In-Bay, so we packed up and headed to Portside Marina on Kelley's Island. Portside Marina was pretty tight to get into, but the marina crew were quick to assist us and on the dock ready to help us tie up. We arrived early in the day Friday, so there wasn't too much going on or too much traffic. Later on though, it was very entertaining watching all the boats crowd in after work around 5-6pm!! Portside Marina is right downtown Kelley's Island. Excerpt from the Kelley's Island Chamber Website: The downtown area remains the heart of island activity where visitors can do everything from shop in unique shops to play miniature golf or just sit and watch passers-by. Restaurants provide both inside and outdoor dining experiences, a complete range of cuisine, and a variety of entertainment on most weekends. Small grocery stores stock just about everything anyone would need. Most visitors enjoy topping off their stay with a hand-dipped ice cream cone or some fresh island fudge. Golf Cart rental is the way to travel on the island! Saturday morning we rented a Golf Cart from the marina and set out to do some exploration! The first and most important stop... breakfast at Kelley's Island Brewery. Breakfast was great and the views couldn't be beat! If I'm craving anything this pregnancy, it's breakfast (with a lot of gravy). From there we continued our trip around the island, with the next stop the Glacial Grooves State Memorial. A National Natural Landmark, the Glacial Grooves on the north side of Kelleys Island are the largest easily accessible such grooves in the world. From a walkway, footbridge and stairs you can look down on the immense grooves, which are 400 feet long, 35 feet wide and up to 10 feet deep, suggesting the tremendous power of the ice that formed them. Of Devonian limestone, Glacial Grooves Geological Preserve contain marine fossils that are 350 to 400 million years old. They were scoured into solid limestone bedrock about 18,000 years ago by the great ice sheet which covered part of North America. Glacial Grooves Geological Preserveis locally managed by the Ohio Department of Natural Resource's Lake Erie Islands State Park. The grooves and the fossils preserved within were very cool to see, and we highly recommend a visit! Inscription Rock is located in Erie County on Kelleys Island. It is one of Ohio's most famous rock art sites. Pre-contact groups of North American Indian poples engraved more than one hundred designs onto a huge limestone boulder on the south shore of the island. The symbols are called "petroglyphs" from the Greek words for rock writing. The precise age of these carvings is unknown. Based on the symbolism and the amount of weathering of the generally soft limestone, they probably are less than one thousand years old and so likely are the work of the the so-called "Late Prehistoric" period Sandusky culture, or the work of American Indian peoples living in the region during the period of European colonization. The large boulders on the north and south shores of the island were dramatic landmarks for the American Indians who lived in the area. Marking the rocks with petroglyphs was one way of making a personal connection with the land. Inscription Rock is listed on the National Register of Historic Places. Overall we really enjoyed Kelley's Island, especially exploring via golf cart and visiting the historical sites on the Island. The island was more laid back than Put-In-Bay, but still had quite the nightlife! It seemed to be a good mix of family activities and nightlife. 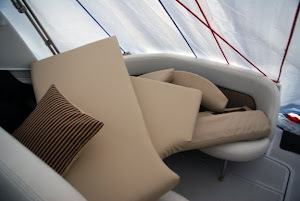 Our next post will have a fun video from our night at Portside Marina (if 2 ft waves in the marina while you're trying to sleep is your idea of fun). :-) We also have some information about our visit to the nice family at Loadmaster Trailers!